That fragment of a 'creed for materialism' which a friend in college had once shown him rose through Donald's confused mind. The Nature of Natural History (1950, 1990), 256-257. All schools, all colleges have two great functions: to confer, and to conceal valuable knowledge. (5 Nov 1908). 'More Maxims of Mark,' Mark Twain Collected Tales, Sketches, Speeches, & Essays, 1891-1910 (1992), 941. In Mark Twain and Brian Collins (ed. ), When in Doubt, Tell the Truth: and Other Quotations from Mark Twain (1996), 43. An inventor is simply a fellow who doesn’t take his education too seriously. You see, from the time a person is six years old until he graduates form college he has to take three or four examinations a year. If he flunks once, he is out. But an inventor is almost always failing. He tries and fails maybe a thousand times. It he succeeds once then he’s in. These two things are diametrically opposite. We often say that the biggest job we have is to teach a newly hired employee how to fail intelligently. We have to train him to experiment over and over and to keep on trying and failing until he learns what will work. In 'How Can We Develop Inventors?' presented to the Annual meeting of the American Society of Society Engineers. Reprinted in Mechanical Engineering (Apr 1944). Collected in Prophet of Progress: Selections from the Speeches of Charles F. Kettering (1961), 108. 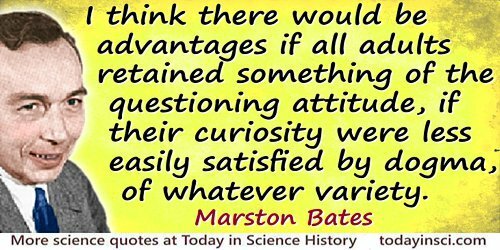 Quoted in G. H. Hardy, A Mathematician's Apology (1940, 1992), 81. But from the time I was in college I learned that there is nothing one could imagine which is so strange and incredible that it was not said by some philosopher; and since that time, I have recognized through my travels that all those whose views are different from our own are not necessarily, for that reason, barbarians or savages, but that many of them use their reason either as much as or even more than we do. I also considered how the same person, with the same mind, who was brought up from infancy either among the French or the Germans, becomes different from what they would have been if they had always lived among the Chinese or among the cannibals, and how, even in our clothes fashions, the very thing that we liked ten years ago, and that we may like again within the next ten years, appears extravagant and ridiculous to us today. Thus our convictions result from custom and example very much more than from any knowledge that is certain... truths will be discovered by an individual rather than a whole people. Discourse on Method in Discourse on Method and Related Writings (1637), trans. Desmond M. Clarke, Penguin edition (1999), Part 2, 14-5. Everybody can be great. Because anybody can serve. You don’t have to have a college degree to serve … You only need a heart full of grace. A soul generated by love. Graduates engaged in post-graduate work are reminded that their Supervisor is a University Officer and when visiting him officially in that capacity they should dress as they would in visiting any other officers of the University or of their own College (e.g. a tutor). Gowns, however, need not be worn in the chemical laboratory. Note from Lennard-Jones to his PhD student, Charles Coulson, 14 Jul 1933. Quoted in S. C. Altham and E. J. Bowen, 'Charles Alfred Coulson 1910-1974', Biographical Memoirs of Fellows of the Royal Society (1974), 20, 78. I entered Gettysburg College intent on preparing for medical school. But my ambition was far from resolute. Every new subject that I encountered in college proved a siren song. I imagined myself an historian, a philosopher, a novelist, rarely a scientist. I graduated from college still knowing nothing of original research in science. 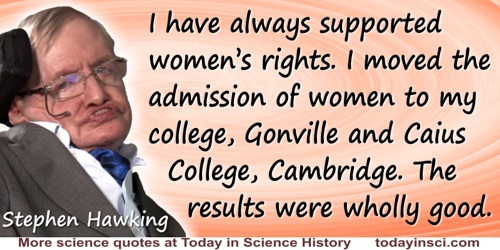 I have always supported women’s rights. I moved the admission of women to my college, Gonville and Caius College, Cambridge. The results were wholly good. From TV show interview with Piers Morgan, on ITV, 'Good Morning Britain'. Transcribed from online video, 'Stephen Hawking on Donald Trump's US: "I Fear I May Not Be Welcome" | Good Morning Britain' on youtube.com website. Also quoted in Sarah Knapton, 'Five Most Powerful People in Britain are Women, says Prof Stephen Hawking', Daily Telegraph (20 Mar 2017). I ought to say that one of our first joint researches, so far as publication was concerned, had the peculiar effect of freeing me forever from the wiles of college football, and if that is a defect, make the most of it! Dr. Noyes and I conceived an idea on sodium aluminate solutions on the morning of the day of a Princeton-Harvard game (as I recall it) that we had planned to attend. It looked as though a few days' work on freezing-point determinations and electrical conductivities would answer the question. We could not wait, so we gave up the game and stayed in the laboratory. Our experiments were successful. I think that this was the last game I have ever cared about seeing. I mention this as a warning, because this immunity might attack anyone. I find that I still complainingly wonder at the present position of football in American education. Address upon receiving the Perkin Medal Award, 'The Big Things in Chemistry', The Journal of Industrial and Engineering Chemistry (Feb 1921), 13, No. 2, 162-163. I was a reasonably good student in college ... My chief interests were scientific. When I entered college, I was devoted to out-of-doors natural history, and my ambition was to be a scientific man of the Audubon, or Wilson, or Baird, or Coues type—a man like Hart Merriam, or Frank Chapman, or Hornaday, to-day. In Theodore Roosevelt: An Autobiography (1913), 23. I wrote a fair amount of poetry in college. It was really, really bad. I mean, bad. And that’s how I found out—by doing it. If we assist the highest forms of education–in whatever field–we secure the widest influence in enlarging the boundaries of human knowledge. In 'Some Random Reminiscences of Men and Events', collected in The World’s Work (1909), Vol. 17, 11104. In college I largely wasted my opportunities. My worst subjects were drawing and science. Almost my only memory of the chemistry class was of making some sulfuric acid into a foul-smelling concoction and dropping it into another student's pocket. From My Own Story (1957), 55. In physics, mathematics, and astronautics [elderly] means over thirty; in the other disciplines, senile decay is sometimes postponed to the forties. There are, of course, glorious exceptions; but as every researcher just out of college knows, scientists of over fifty are good for nothing but board meetings, and should at all costs be kept out of the laboratory! Defining 'elderly scientist' as in Clarke's First Law. 'Hazards of Prophecy: The Failure of Imagination'. In the collection. Profiles of the Future: An Enquiry into the Limits of the Possible (1962, rev. 1973), 14-15. It is worthy of note that nearly all that has been done for the improvement of the steam engine has been accomplished, not by men educated in colleges or technical schools, but by laborers, mechanics, and engine-men. There seem to be instances where the mechanical instinct takes precedence over the higher powers of the mind, in efficiency in harnessing the forces of nature and causing them to do our work. In paper 'Stephenson and Transportation' (1916), collected in Francis Edgar Stanley, Theories Worth Having and Other Papers (1919), 66-67. Like so many aging college people, Pnin had long ceased to notice the existence of students on the campus. My interest in chemistry was started by reading Robert Kennedy Duncan’s popular books while a high school student in Des Moines, Iowa, so that after some delay when it was possible for me to go to college I had definitely decided to specialize in chemistry. Letter (4 Apr 1932) to Pauline G. Beery. Hagley Museum and Library Collection, Wilmington, Delaware. 1784.) As cited in Matthew E. Hermes, Enough for One Lifetime: Wallace Carothers, Inventor of Nylon (1996), 13. My price is five dollars for a miniature on ivory, and I have engaged three or four at that price. My price for profiles is one dollar, and everybody is willing to engage me at that price. Explaining how as an artist he would create income to pay his debts while at college. Letter to his parents (25 Jun 1810). Samuel F.B. Morse: His Letters and Journals (1914), vol. 1, 20. My two Jamaican cousins ... were studying engineering. 'That's where the money is,' Mom advised. ... I was to be an engineering major, despite my allergy to science and math. ... Those who preceded me at CCNY include the polio vaccine discoverer, Dr. Jonas Salk ... and eight Nobel Prize winners. ... In class, I stumbled through math, fumbled through physics, and did reasonably well in, and even enjoyed, geology. All I ever looked forward to was ROTC. Autobiographical comments on his original reason for going to the City College of New York, where he shortly turned to his military career. My American Journey (1996), 23-26. ROTC is the Reserve Officers' Training Corps (ROTC) school-based program of the U.S. military. From there, the self-described 'C-average student out of middling Morris High School' went on to become a four-star general. Some people get an education without going to college; the rest get it after they get out. Seen on the web, without citation, incorrectly attributed to Mark Twain. Webmaster has not yet found a book with this quotation, and greatly doubts that it is a Twain quote. Stay in college, get the knowledge. And stay there until you’re through. If they can make penicillin out of moldy bread, they can sure make something out of you. Advice to a young person to continue his education. From address to students at New School for Social Research, New York City, 'Words of the Week',Jet (3 Jan 1980), 57, No. 16, 32. Opening lines of 'The Rhythmic Claims of Freedom and Discipline', The Aims of Education: & Other Essays (1917), 45. The Good Spirit never cared for the colleges, and though all men and boys were now drilled in Greek, Latin, and Mathematics, it had quite left these shells high on the beach, and was creating and feeding other matters [science] at other ends of the world. The Prose Works of Ralph Waldo Emerson (1870), 553. The hospital is the only proper College in which to rear a true disciple of Aesculapius. In William Osler, Aequanimitas (1906), 328. The only way to get rid of the [football] combats of gorillas which now bring millions to the colleges will be to invent some imbecility which brings in even more. To that enterprise, I regret to have to report, I find myself unequal. From American Mercury (Jun 1931). Collected in A Mencken Chrestomathy (1949, 1956), 372. As quoted in Paul L. Montgomery, 'Psychopoetry: A New Way of Reaching the Disturbed', New York Times (17 Apr 1971), 31. Training is everything. The peach was once a bitter almond; cauliflower is nothing but a cabbage with a college education. Pudd'nhead Wilson and Those Extrraordinary Twins (1894), Chap. 5. In Mark Twain and Brian Collins (ed. ), When in Doubt, Tell the Truth: and Other Quotations from Mark Twain (1996), 43. Within 100 years the profession of teaching has grown from about one-twentieth to one-fourth of the [college] graduates… Since 1880 the line for teaching has crossed that of the ministry, and since 1890 that of law. Thus at the close of the century it is the dominant profession. Professional Distribution of College and University Graduates (1912). Quoted in Bruce A. Kimball, The True Professional Ideal in America: A History (1996), 198. [I doubt that in today's world, I and Francis Crick would ever have had our Eureka moment.] I recently went to my staircase at Clare College, Cambridge and there were women there! he said, with an enormous measure of retrospective sexual frustration. There have been a lot of convincing studies recently about the loss of productivity in the Western male. It may be that entertainment culture now is so engaging that it keeps people satisfied. We didn't have that. Science was much more fun than listening to the radio. When you are 16 or 17 and in that inherently semi-lonely period when you are deciding whether to be an intellectual, many now don't bother. Quoted by Tim Adams in 'The New Age of Ignorance', The Observer (30 Jun 2007).